Centrepieces speak volumes at a wedding or event. They can be in the middle of a dessert table, on display in the middle of the dinner table or making the decorations of your party pop. They can be flowers, games, a very large birthday cake, or something you hold very dear to you. Either way you spin it, a centrepiece can make or break the decorations of your party or event. Through my extensive browsing of many party websites, event and wedding blogs and through attendance and organisation of many events myself, I have compiled a list for you about the top 4 best centrepieces that spark a cool atmosphere at an event. I’m having a bit of a board game marathon with my husband and our friends at the moment, and when I saw the use of childhood games as a centrepiece at “Big Kids” themed wedding on Rock n Roll Bride I knew it would instantly be one of the best centrepieces ever! 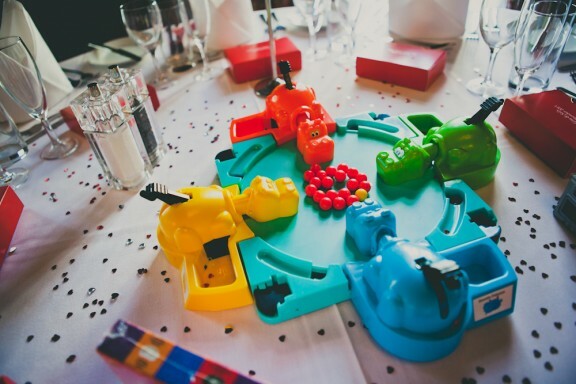 The wedding utilised classic childhood games like Hungry Hungry Hippos, Operation and Buckeroo and used them as colourful and fun centrepieces that reflected the theme of the wedding. The best bit? Your guests can play them as an ice breaker if they don’t know anyone else at the table, or if they get bored – not that they are likely to at your event! You just dropped almost $350 on a beautifully designed and wonderfully crafted three-tiered chocolate cake with sugar roses and fondant cake toppers. 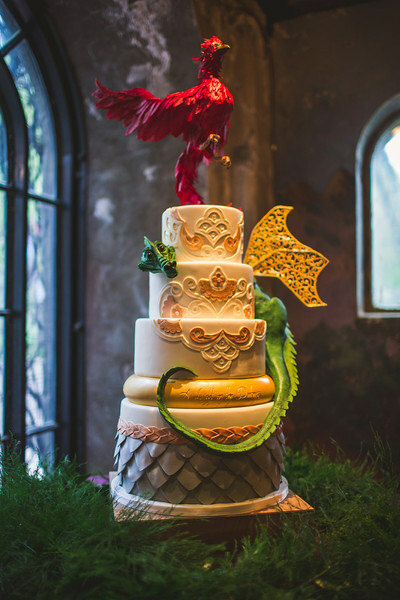 Why would you go through all the agony of sampling and tasting wedding cakes, buying the perfect cake topper that symbolises you, and getting someone to make it for you if you were just going to shove it out the back in the kitchen for someone to cut up and serve at dessert table? Use that beauty as a centrepiece for your dessert table, or a decoration tool that will tie all of your other decorations together – after all, it is highly likely to be in theme with your event, and it gives your guests something to talk about, as well as drool over. No body said that centrepieces have to sit in the middle of a table and take up exact proportions from table runner to the edge of the table. Thinking outside the box makes for some memorable moments at the party, and you can do just that with your centrepieces by getting them off the table, rather than just sitting on it. The particular decoration items that I am talking about help incorporate the rest of the venue and tie the whole décor of the room in with your dessert table or dining room arrangements. 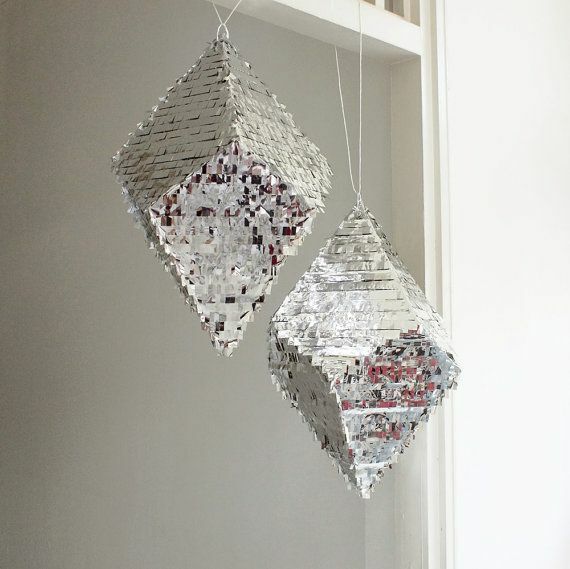 Get hanging items that match your theme, such as paper ball lanterns or tissue paper pom poms in coordinating colours, or to be more on trend, a fringed geometric piñata, to tie not only the table together, but the whole venue as well. Hang them down so that they sit at just the right height above the tables, and lay out a table runner with some candles and vases of flowers beneath it. Simple, decorative, and just like a work of art it will give your guest a trail of beauty of draw the eye line to all decoration aspects – not just the ones on the table. Tealight candles, votive candle holders and tapers in chandelier sticks. If you want to add a bit of va va voom to your special event you can never go wrong with the soft fiery light of an open flame. Couple it with fairy lights, lanterns and other beautifully ornate and delicate decorations and you have a sophisticated soiree. But when the tealight candles have been all said and done, how do you make your twinkling divine unique and special? 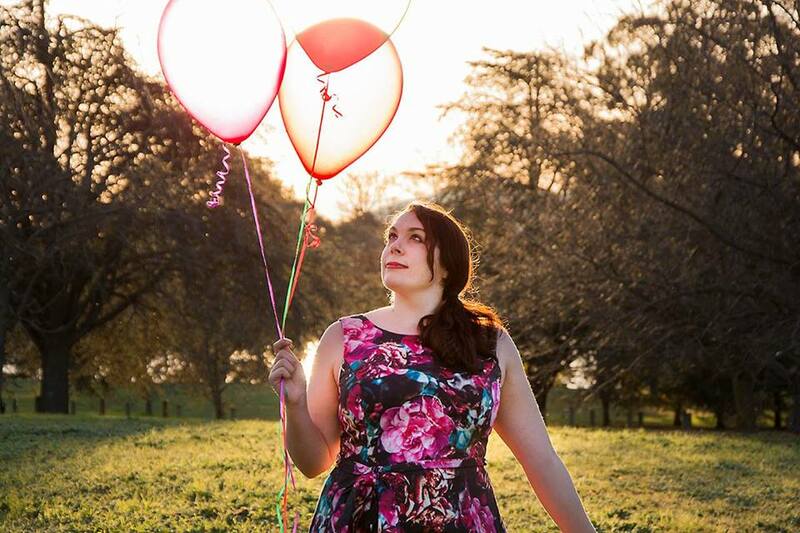 Well, you can opt for one of my favourite versions – and something I am more than a little biase to because I used it at my own wedding – Fireflies in a Jar. 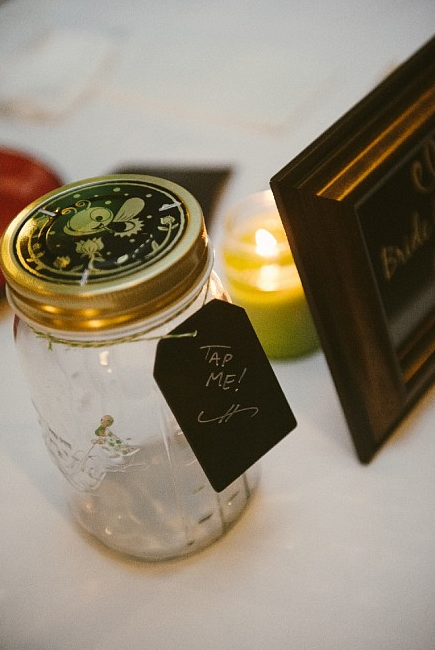 We chose to incorporate fireflies into our wedding based on a beautiful and romantic trip we took in Malaysia and we found these perfect symbols of this adventure from a cute little boutique online. They were automatic and moved when the jar was tapped or bumped, so they lit up as guests sat down and ate their dinner. All night people we’re tapping on the tops to make them go and people thought we had actually caught real fireflies to use! If Fireflies are a bit random for you, you can use the same idea by putting tea light candles in jars, use ornate lanterns as the decorations or utilsing strings of fairy lights stuffed into a vase. The ultimate goal is to make your centrepiece the most shiniest thing ever! So there you have it, 4 centrepieces that are easy to obtain, quirky and would make your event super special. If you use any of these ideas, or have some more of your own, drop me a line in the comments below and have a great event!